Gene and I spent most of the weekend canning. We had friends from work come over on Saturday, and we harvested enough blackberries to make 14 pints of blackberry jelly and 5 pints of blackberry syrup. Then today, we canned peaches, pears, and apples, and made tomato sauce. Last week we canned more blackberries, and made salsa and ground cherry jam . 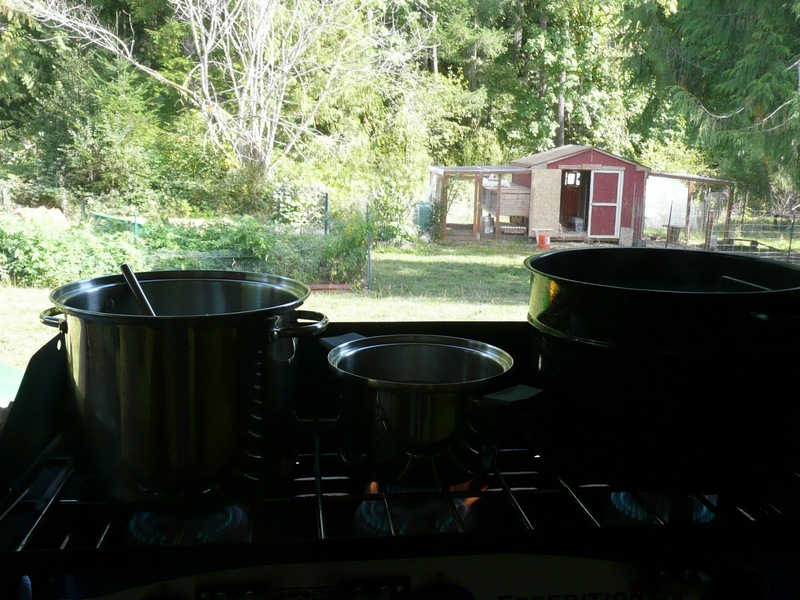 Gene had the brilliant idea of moving the canning station inside to the covered porch he built last year, which means we can process fruits and veggies anytime without having to worry about the weather. It’s also bug and wind free, although it’s not kitty and puppy free. That’s the only drawback. I was a little worried because I always thought you weren’t supposed to use propane inside, but I guess it’s ventilated enough. We’re not dead yet, anyway, and we’ve been canning a lot. When I’m not canning, I’ve been harvesting. 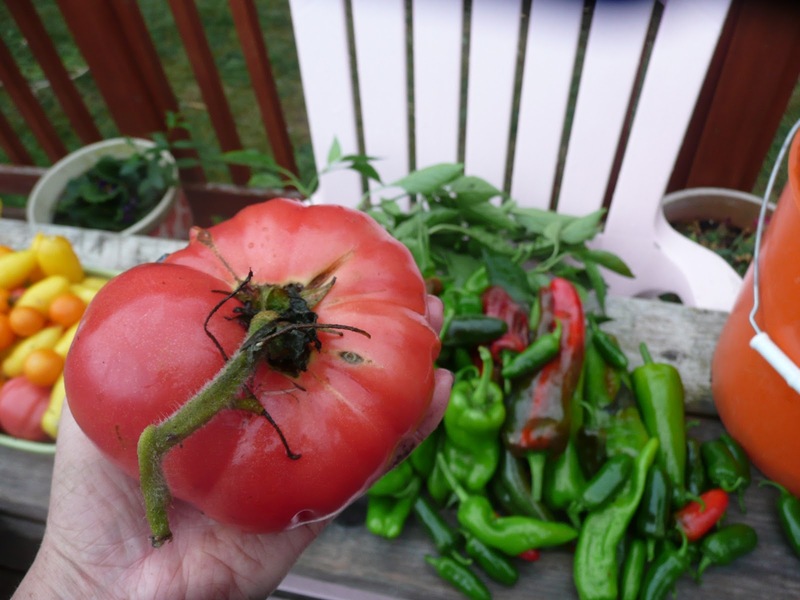 I even tackled the Tomatonator, which is disconcerting. The ripe tomatoes are all hiding inside the shrubbery, and the green ones ring the perimeter. Unfortunately, the spiders lurk inside too. I really really really wanted to make salsa though, so I downed some liquid courage (of the bright blue wine cooler variety, cuz I’m classy like that), and dove in. Literally. Since the tomato bushes are about five feet high, I have to part the branches and lean in to get the ripe ones. In addition to hoards of spiders, the Tomatonator is also home to birds and wild rabbits, neither of which enjoys being disturbed and both of which will let you know by exiting the shrubbery straight at your face. Harvesting the peppers for the salsa was also challenging, although more in a culinary sense rather than an “oh my god it’s coming right for us” kind of way. 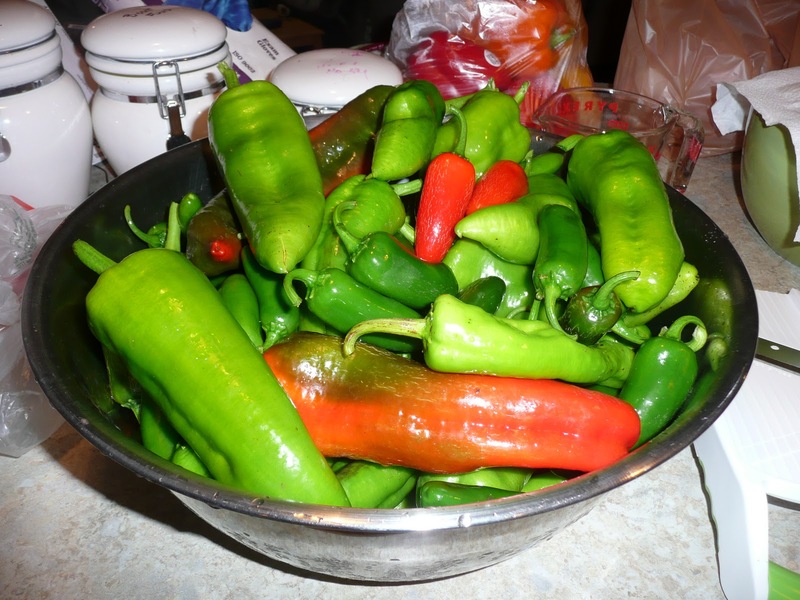 I was sampling the peppers, trying to find the hot variety I was sure I planted, but none of them were the least bit spicy. Until you eat a whole one. Then it tastes like fire, for the rest of the day. The salsa is going to be awesome though. 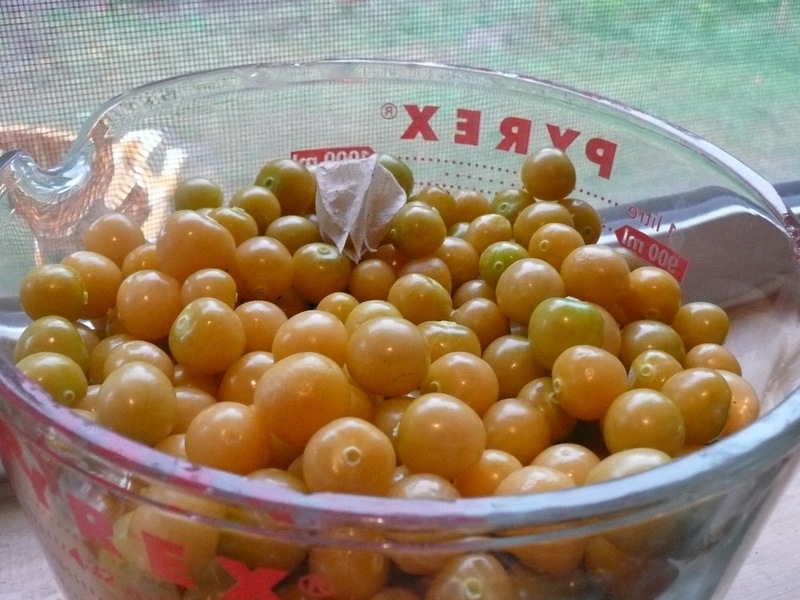 Harvesting the ground cherries was my favorite crop, since they taste fresh and citrusy, and they fall on the ground when they’re ripe. You don’t have to fight birds, squirrels, or spiders to get them. For those of you who don’t know what they are, they are related to tomatillos and gooseberries; they grow in paper husks which you remove right before eating them. They make excellent jam, and are good in pies or eaten raw in salads. Or right out of the harvesting bucket, if you’re me. 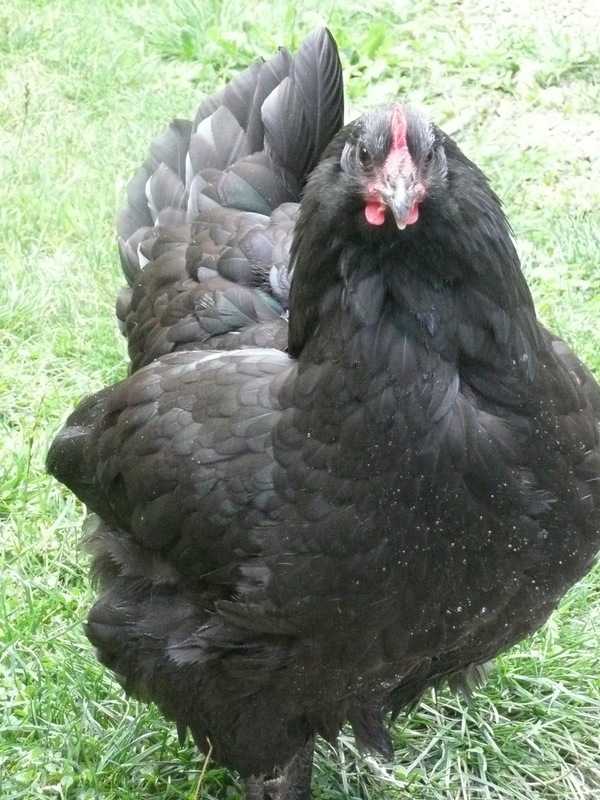 In farm animal news, Condi is still broody. All she wants to do is hang out in the shed. I even tried dunking her in a bucket of cold water a few times, in an effort to get her body temperature down. (It increases when they’re broody, since the instinct to incubate their eggs has kicked in.) 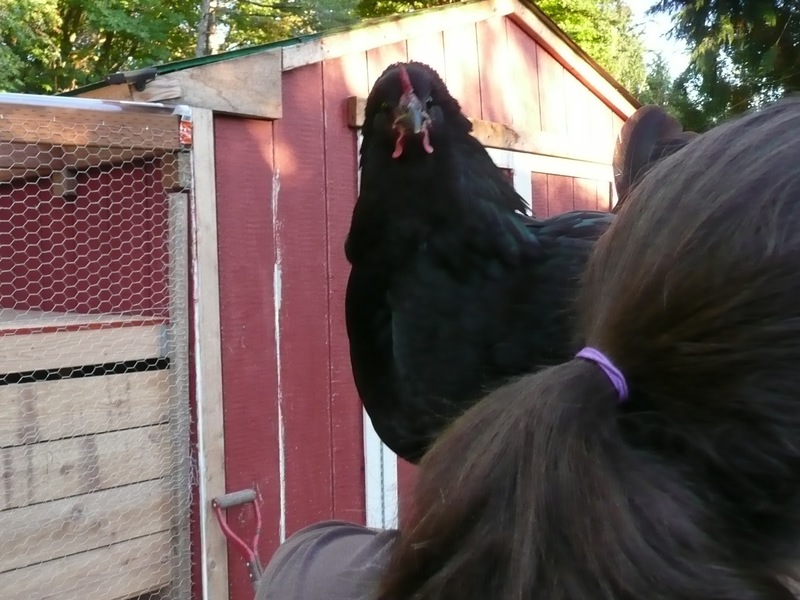 I thought she was annoyed when I kept kicking her out of the coop… that’s nothing compared to how she got after being dunked in the bucket. She ran in circles around me squawking and huffing and puffing, and then went straight for my head. Again. She sat on my shoulder for awhile, and this time Gene was out there so he could take a picture. Which also would have been useful to show the EMTs, had she been successful in plucking out my eyeballs like I’m sure she wanted too. When I put her back down on the ground, I made the mistake of turning my back on her, and she climbed up the back of my shirt using her talons. Apparently she’s not a fan of bathing. Paris, Nikki, and the Bedonkaduck are huge fans of the water, no matter what temperature it is outside. They are good friends now, and will even eat out of the same food bowl without chasing each other off. The Bedonkaduck and Paris sleep together on the roof, but poor Nikki hasn’t figured out how to get up there yet. She likes to hang out with the turkeys instead. 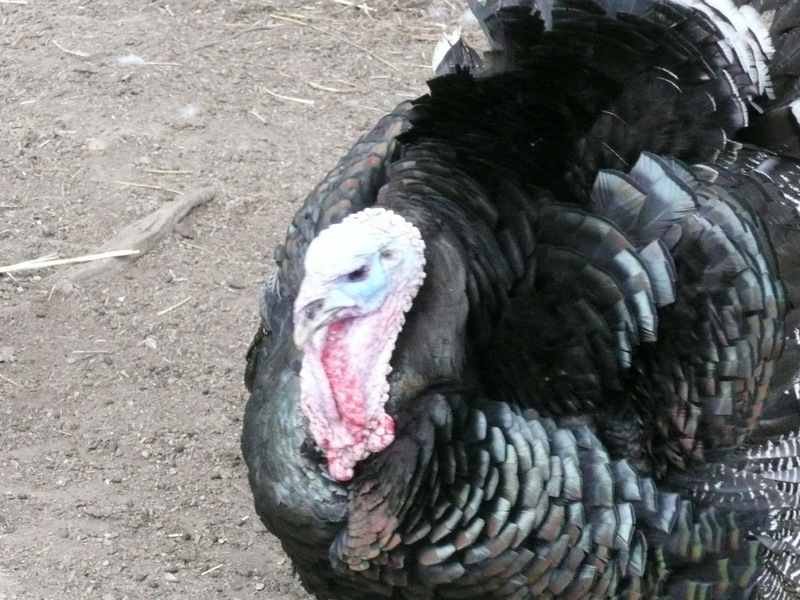 Speaking of turkeys, I don’t think I’ll feel bad about eating Thanksgiving. 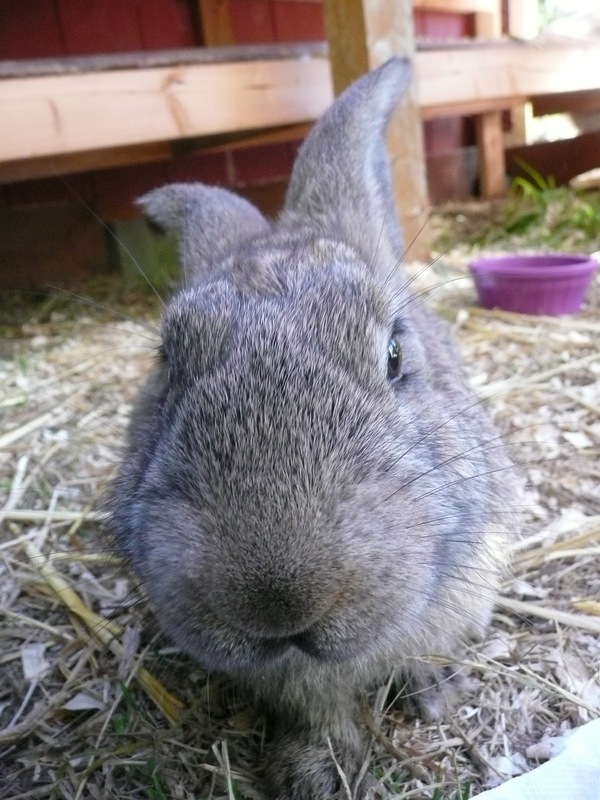 He’s gotten so fat now he can barely waddle around; the fastest he ever moves is when I fill their food bowl at night. He’s like the 600 lb guy that hangs out in the recliner all day. Sure he’s happy, but it’s kind of a quality of life issue. He still gets it on with Christmas with stunning regularity though, he’s got some serious moves for a fatty. I’m not sure how Christmas stays so thin, since she also eats everything in sight. She’s like the annoying friend we all have who eats dessert every time you go out but never gains weight. I’ve discovered that in addition to watermelon, she loves apples, peaches, and pears. All the critters were ecstatic this weekend because they got all the scraps from canning. Harvey and Claire were especially happy, since it’s a lot of work to maintain their epic growth rate. It’s a good thing Gene built the Bunny Ranch to the scale that he did, because dang. They’re growing fast. They can mow their way through a handful of grapes and a few leaves of chard before you even have time to close the gate. They’ve become very friendly, and actually like to cuddle with people now. Always a good trait in 40 pound bunnies. Cracks me up about Christmas and her fast metabolism. Although I was reading somewhere else in your blog about your bunnies w/beer bellies….hmm I didnt know bunnies drank beer..try Bud Light!